Well, it has happened once again. My hard drive ate my homework. The secondary hard drive I store all of my archived max files died recently for some bizarre reason. What this means is I have lost all of the Virtual Satellite 3.0, and Crow 1.5 (Never uploaded). I have a really old backup of the virtual satellite from May of 2001, but Crow will have to be completely recreated, and in all honesty, from the stages the VSOL was at at that time, so will it. 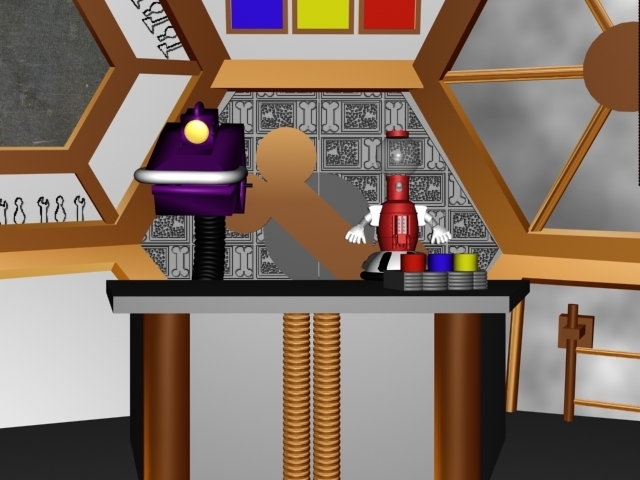 Thankfully, Servo, being a somewhat recent project, was stored in a different folder and has been spared, as has the theater tunnel sequence. I have found myself working less and less in max in recent times, and as a result, I cannot be sure when, if ever, Crow and the VSOL will be updated again. Update to the Update: I discovered I'm a bit more repetitive than originally thought. All of my 3D studio files happened to be archived in a back up directory on my website. The files are old, but not nearly as old as my original back ups, made at the end of my junior year in High School. Thankfully though, Crow is in this list of files, so I will not have to recreate him. Hopefully now, I will make some progress on my 3D files sometime this millenium. This is the beginning of what was to be a small project in December of 1999. This file represents my original attempt at the hexfield, along with the main portion of the bridge. By this point, I had evolved along and built the rest of the set. Gypsy and Tom are also present, in their original incarnations. The set though, at this point, was largely flat, curving only about 10 degrees. This would all change soon, when I set out to incorporate textures and true to life dimensions. Here, presented finally, is the Virtual Satellite Of Love Version 3.0. The latest and greatest fully 3D rendering of the SOL Bridge. This version, although it is hard to tell, is a complete rebuild, from the ground up, of the original set. Changes evident are true to life sizing, a 100% accurate desk console, and an immense amount of lighting work. Also, you can see authentic gaff tape lines on the desk... oooooh. Here is The Virtual Satellite Version 3.0 with Movie Sign activated. The lights themselves actually glow, through some marvelous effects that took way too long to apply, and take a really long time to render. Oh, and in case you were wondering, there is no virtual satellite 2.0. That version was lost in the great Max glitch of early 2001... so I decided simply to skip it. This is "MOVIE SIGN!" to Version 1.5 of the Virtual Satellite. It runs from the main set, all the way to a greenscreen at the theater. Ultra Compressed AVI, then zipped to 920 k, so anyone can download it. It has no sound, but Servo and Gypsy both mouth "Movie Sign!" Presented live! and in out of this world technicolor: A full and complete rendering of the Virtual Satellite Bridge, and tunnel sequence, all the way through to the theater, complete with sound. It is 30 seconds long, and is 3.5 megs, 320 X 240, ultra compressed Indeo 5.10 and zipped. Crow was the last of the robots for me to start on, due to his complexity. I have built and rebuilt his floralier 6 times, and am still not satisfied with it. Well, it gives me something to work on for version 2.0. Here he is presented in one pic with a front view, and a view at a 45 degree angle. There you have it, Crow, 1.0. 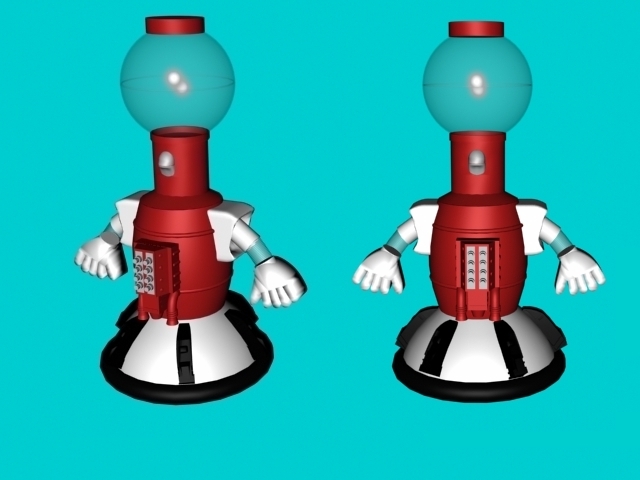 This picture represents version 1.0 of Tom Servo. This was done at a time when I still had limited available time in 3d Studio, and even more limited knowledge of 3d work itself. Also, this was built at a time while I was still collecting Servo's parts, and as a result, had little more for comparison than various still shots from the show. 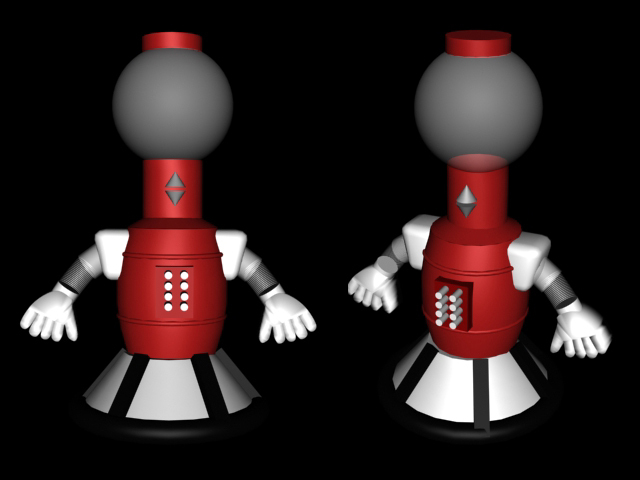 This is version 1.8 of Tom Servo. By this point I had progressed along quite far, having redesigned the both engine block and turbo trains. 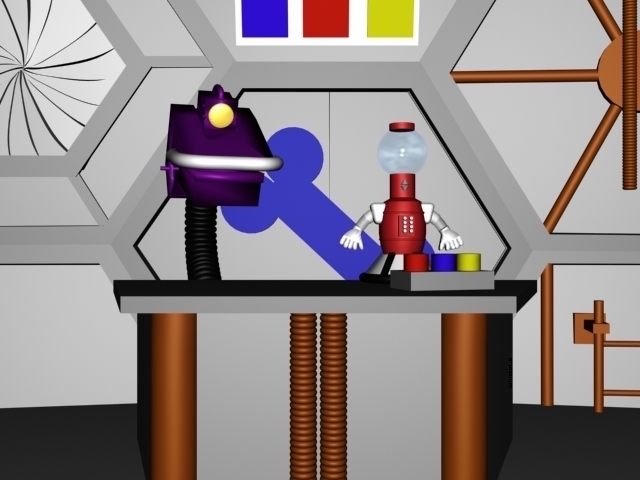 At this time, I in all actuality, planned to rebuild Servo's hands (a chore in itself) and then immediately release 2.0. As I delved back into working on Servo, I realized that his proportions were off substancially, and much more work needed to be done. 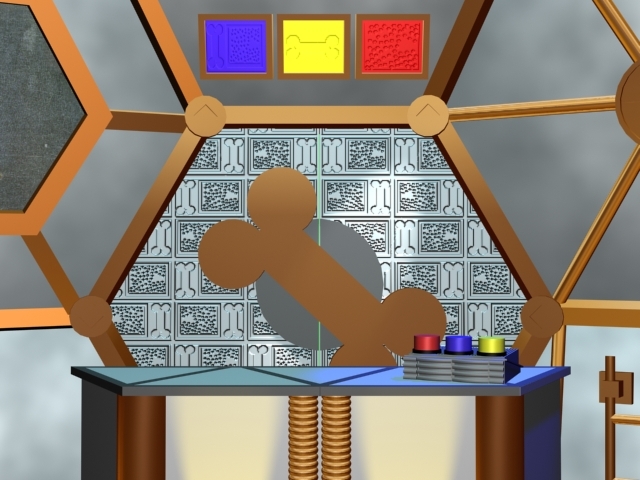 As a result, by the time 2.0 was released, nearly all of Servo would be rebuilt once again to achieve increased levels of realism. 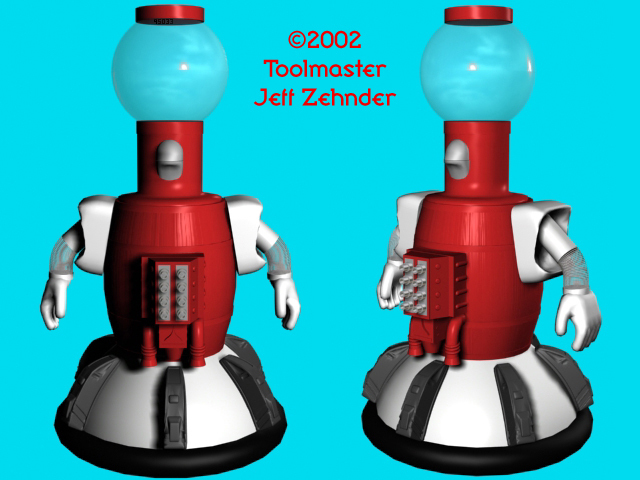 Servo was the first of the bots I started on, and this version represents the second complete incarnation of Servo in 3D. He has been the most fun to work on, due in part that I have a completed Servo to which I was able to make simple size and shape comparisons to. Comparing to the actual bot also has it's downsides, as it forced me to spend increased amounts of time on making things look as close to perfect as possible. Here is an avi of Crow. This was released about a week before Crow actually was finished, and is a preview, so a few small differences are noticeable. 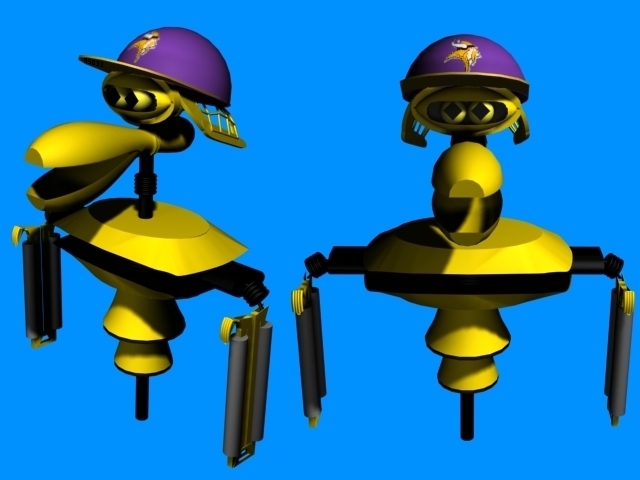 Crow's wearing the hat of his favorite team, the Minnesota Vikings... why? you ask? Because his XL7 looks retarded when I stand it up. Again, 3D is hard. Enjoy! 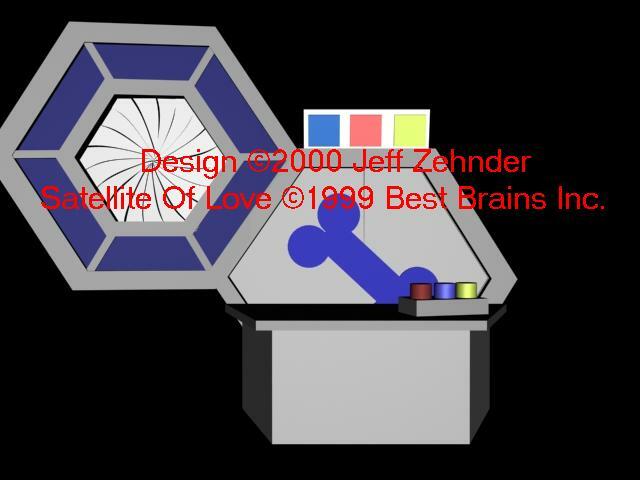 This page �2000 - 2002 Jeff Zehnder Jr. (MSTIE#95033) And Classic Arrow Inc.
Mystery Science Theater 3000 and the characters therein are �1989 - 2002 Best Brains Inc. All Rights Reserved. 3D Studio Max is �2002 Autodesk Inc.
Special Thanks To John Geraghty, the best CAD teacher the world could ask for.